Conveniently the Catholic mainstream media passes over in silence Pope Francis' doubling down on the contention that his teaching is part of the social doctrine of the Church, especially Laudato Si. Now we turn to what he said about Cuba, which occupies most of the interview. ... I would like to meet with everyone. If you want me to speak more about the dissidents, you can ask me something more concrete. For the nunciature, first, it was very clear that I was not going to give audiences because not only the dissidents asked for audiences, but also audiences (were requested) from other sectors, including from the chief of state. And, no, I am on a visit to a nation, and just that. I know that I hadn’t planned any audience with the dissidents or the others. And secondly from the nunciature, some people made some calls to some people who are in these groups of dissidents, where the responsibility was given to the nuncio to call them and tell them that I would greet them with pleasure outside the cathedral for the meeting with the consecrated (religious). I would greet them when I was there, no? That did exist. Now, as no one identified themselves in their greetings, I don’t know if they were there. I said hello to the sick who were in wheelchairs. … Oops, I’m speaking Spanish. I greeted those who were in wheelchairs, but no one identified themselves as dissidents; but from the nunciature calls were made by some for a quick greeting. ... No, I didn’t receive any private audience. That is for everyone, and there was a head of state; I told them “no.” And that I didn’t have anything to do with the dissidents. The contact with the dissidents was what I explained. The Church here, the Church in Cuba, made a list of (prisoners) for the pardon; more than three thousand were given the pardon, the president of the bishops' conference told me. Pope Francis: There were more than 3,000 and other cases are being studied. The Church here in Cuba is commited to this work of the pardons. 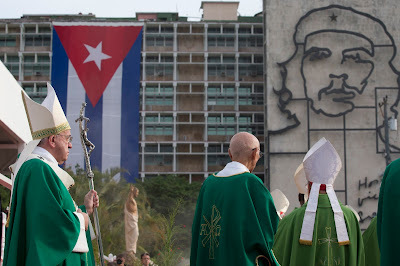 In short, Francis denies ever having wanted or planned to meet any of Cuba's dissidents in a private audience. (Of course, he had time to meet with Fidel Castro! What message does that telegraph to Cuba's long-suffering dissidents?) The most he was planning to do was "greet them with pleasure" outside the Cathedral. "But isn't in wonderful that prisoners were released in honor of the Pope's visit?" Yes, that is true. It's wonderful. What neither the Pope nor Fr. Lombardi mention is that NONE of the 3,522 prisoners freed by Cuba in time for the Pope's visit were political prisoners -- the Guardian reported it more than a week before the papal visit. Finally, the Pope's comments on Fidel Castro and the Cuban system itself. Regret is a very intimate thing, and it’s a thing of conscience. I, in the meeting with Fidel, I spoke of the stories of known Jesuits, because in the meeting I brought a gift of a book, from Fr. Llorente, also a good friend of his, who is also a Jesuit. And also a CD with the conferences of Fr. Llorente and I also gave him two books from Fr. Pronzato [sic] which I’m sure he’ll also appreciate. And we talked about these things. We spoke a lot about the encyclical, Laudato si'. He’s very interested in the issue of ecology. It was a not-so-formal, rather spontaneous meeting. Also his family was present there. Also those who accompanied me, my driver, were present there. But, we were a bit separated from his wife. They couldn’t hear, but they were in the same place. But we spoke a lot on the encyclical because he is very concerned about this. About the past, we didn’t speak. In short the meeting was mainly about Laudato Si, not about Castro's "conversion" or telling him off for what he has done or anything else that some Catholics -- the ones still in denial over this pontificate -- have dreamed about in recent days. Pope Francis: In the speeches that I made in Cuba, I always put the accent on the social doctrine of the Church. But the things that must be corrected I said clearly, not “perfumed,” or soft. But, also the first part of your question, more than what I have written – and harshly – in the encyclical, also in Evangelii gaudium, about wild, liberal capitalism – I didn’t say it. All that is written there. I don’t remember having said anything more than that. If you remember, let me know. I’ve said what I’ve written, which is enough, enough. 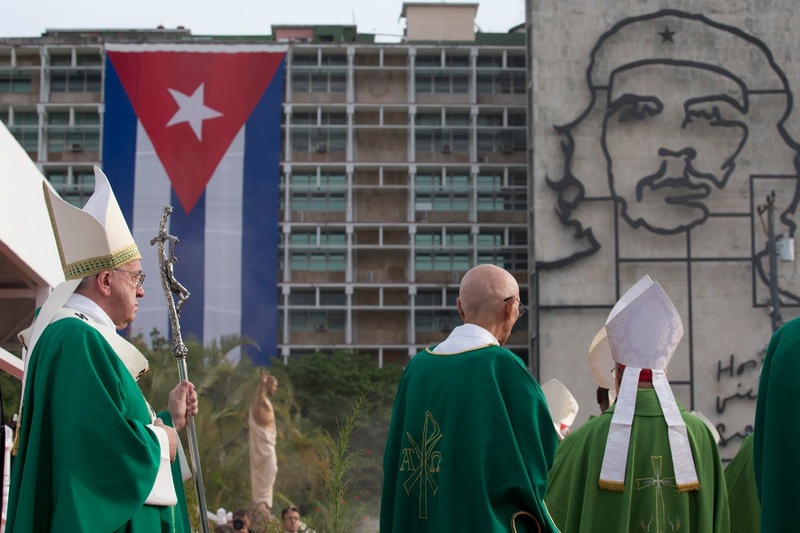 So, Pope Francis denies that Cuba is a "sick" country, and specifically denies that it is "aggressive" against the Church -- despite the well-documented repression, discrimination and denial of access to transport and communications that the Catholic Church in Cuba continues to face. Not only that but the Pope claims that he spoke "clearly" about the "things that must be corrected" in Cuba -- well, can someone please show us where he said anything that was clearly critical of the Cuban system?